BOSTON (AP) — Rookie Andrew Benintendi hit a three-run homer that capped a five-run fifth inning, and the Boston Red Sox began their post-David Ortiz era by beating the Pittsburgh Pirates 5-3 in Monday’s opener. Reigning AL Cy Young Award winner Rick Porcello (1-0) gave up three runs and six hits in 6 1/3 innings while striking out five. Craig Kimbrel retired Starling Marte on a game-ending popup with two on for the save. Playing the team it beat in the first World Series in 1903, Boston opened against a National League opponent for just the second time. Gerrit Cole (0-1), the first overall pick in the 2011 amateur draft, gave up five runs and seven hits in five innings. Ortiz retired after last season after helping the Red Sox win three Series titles, their first since 1918. Even without Ortiz, there was still plenty of pageantry at Fenway Park. The ceremonial first pitch was attended a quintet of members Super Bowl champion New England Patriots headlined by MVP quarterback Tom Brady, who made the toss. They were joined by owner Robert Kraft and all five of the franchise’s Lombardi trophies. It may have brought the hometown team some good luck. Boston had only two hits before Jackie Bradley Jr.’s two-out triple to right in the fifth. He scored the first run after Pablo Sandoval beat out a sharp grounder to shortstop Jordy Mercer. Sandy Leon bunted his way on, Sandoval scored on Dustin Pedroia’s line-drive single up the middle and Benintendi homered. Porcello allowed only three hits through six innings. Josh Harrison had an RBI single in the seventh, and the Pirates added two runs off Matt Barnes before before Andrew McCutchen struck out for the third time. Red Sox: LHP David Price (left elbow) is still working on increasing his throwing distances and is set to throw again Tuesday. ,,, Manager John Farrell said RHP Tyler Thornburg (right shoulder) is still isn’t throwing. Pirates: RHP Jameson Taillon has a 5-4 record and 3.38 ERA in 18 starts with the Pirates. Red Sox: LHP Chris Sale makes his Boston debut after being acquired in an offseason trade with the White Sox. It wouldn’t be the first time Tom Brady had his jersey stolen. In an unexpected Opening Day appearance Monday, Brady brought his game-worn Super Bowl LI jersey onto the field at Fenway Park during the pregame first pitch ceremonies. The Patriots quarterback, several teammates, and owner Robert Kraft showed the team’s five Super Bowl trophies, as well as Brady’s recently recovered jersey. But wait. 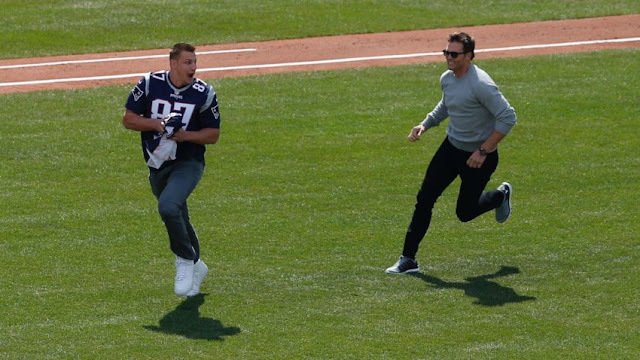 Tom, look out — it’s Gronk! As Brady held up the jersey to the cheers of Red Sox fans, Patriots tight end and general troublemaker snuck up behind him and made off with the already-once-stolen jersey — forcing the 39-year-old quarterback to chase down and tackle his teammate. BOSTON — The Red Sox’s outfield didn’t meet Joe Kelly’s request, but it still put on a show at Fenway Park on Monday. Boston held on for a 5-3 Opening Day win over the Pittsburgh Pirates, thanks in large part to a three-run home run by rookie left fielder Andrew Benintendi. The Red Sox’s outfield started the tradition last year of doing a victory dance after wins, and Benintendi, Jackie Bradley Jr. and Mookie Betts carried that tradition into 2017 — with a little twist. We don’t hate it. The Red Sox are projected to win their fair share of games this season, so we could see a whole lot more dancing going forward. 0 Response to "Andrew Benintendi lifts Red Sox over Pirates in first game of post-Ortiz era"